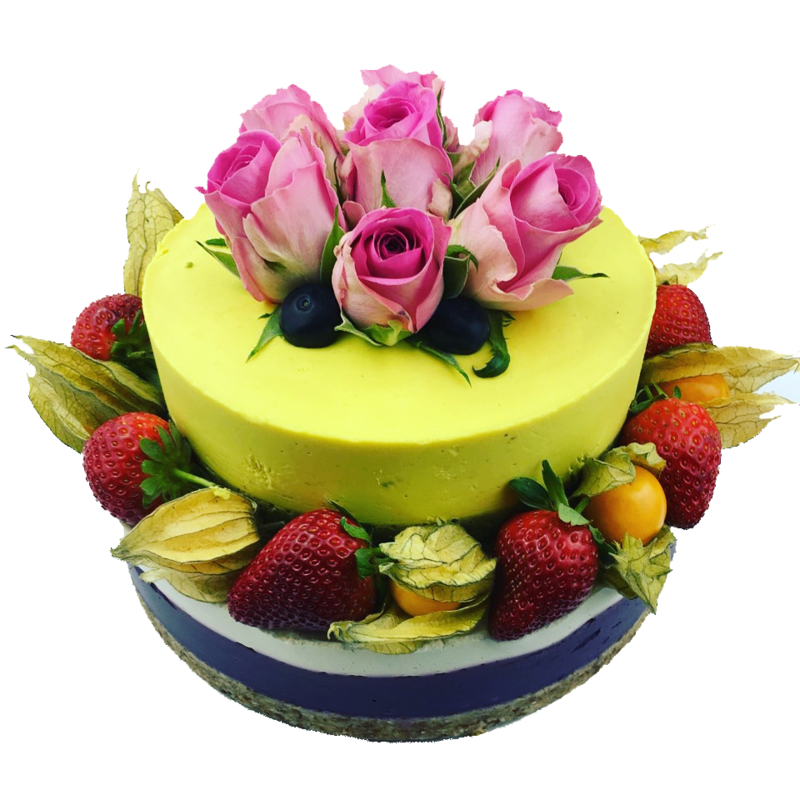 A stunning two tier raw cake, beautifully decorated with fresh flowers and fruits. Please choose using the options on the right-hand side. B Raw Cakes's range of raw cakes are carefully handcrafted in London using the best wholefood ingredients such as fruits and nuts, offering a healthier alternative to a delight everyone enjoys - cakes. They believe that the best place to start improving health is by improving diet, which is why they jam-pack their delicious cakes with as much pure & seasonal goodness as they can get their hands on. Keeping the ingredients raw helps preserve their nutrients. Special dietary needs? B Raw Cakes's products are allergy friendly for anyone with a gluten or a dairy intolerance, and are also suitable for vegetarians & vegans and Kosher certified. Free from gluten, dairy, refined sugar, eggs, soy preservatives, additives and colourings. Approx. 3kg, the bottom tier is 8 inches and the top tier 6 inches. Storage: Raw cakes must be refrigerated and will keep for 5 days. 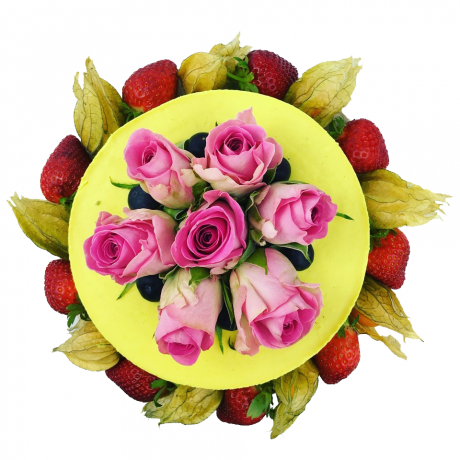 Raw cakes can be frozen on day of delivery for up to 8 weeks. Frozen cakes should be left at room temperature for 2 hours before serving or can be thawed in a fridge overnight. DELIVERY: Please note that B Raw Cakes only deliver to London post codes. Please allow a minimum of 2 working days for delivery. Please see individual listings for ingredients and allergy information. Yummy, yummy and more Yummy! Yummy, yummy and more Yummy!! I purchased the mixed flavours and they were individually sublime... beyond delicious! Delivery was right on time too, as agreed. Perfect. First time we ordered and we are so happy with the cake. Came looking amazing and taste was amazing. Would definitely recommend and I will be ordering again. All flavours are truly delicious, if you really can't decide I'd thoroughly recommend the assorted 8 inch raw cake. Perfect for a celebration and visually stunning! Exquisite raw cakes handcrafted in London, inspired by nature and full of flavour.